When my husband and I were looking at homes, that backyard was important to us. We didn’t need everything perfect right away, but we wanted to make sure that the yard and property was conducive to our overall plans. While we wanted an open, deck porch or patio, we wanted a feeling of privacy at least in part of the space. 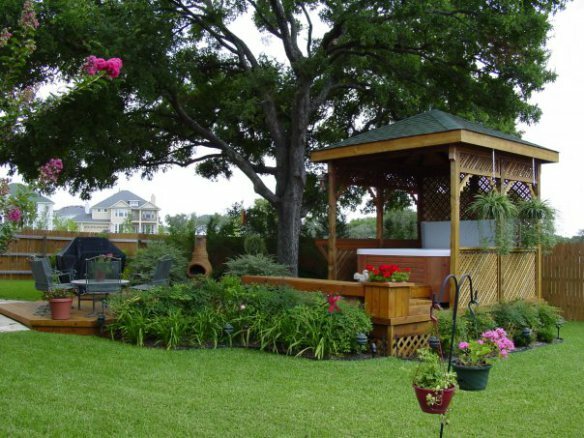 While trees, shrubbery and other landscaping can play a major role in creating a private backyard, so can a structure. 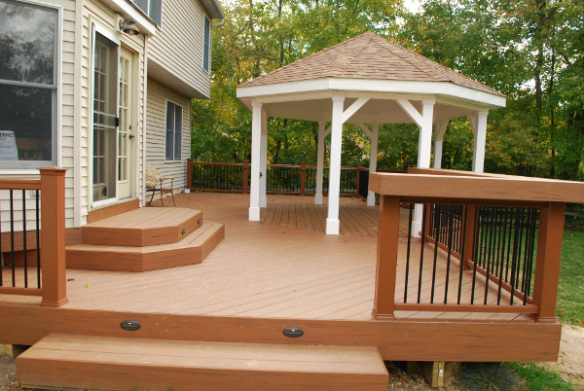 This deck and porch project from Columbus, OH is a great example of how to have private and open areas in one outdoor space. This existing deck didn’t have anything wrong with it. It provided the necessary space the owner’s need to both cook and eat outside, but they wanted a private area. 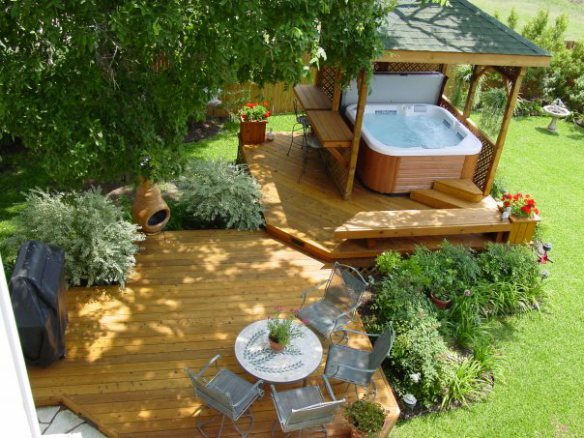 The homeowners were looking to purchase a new hot tub, but didn’t want it out on the open deck. 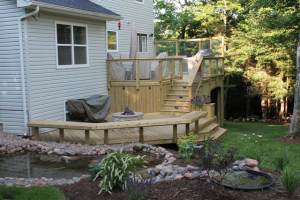 Rob Mitchell of Archadeck Outdoor Living, patio and deck builder in Columbus, designed and built the perfect solution. 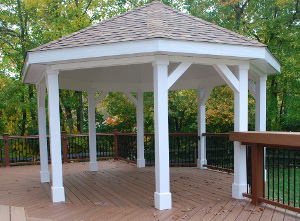 The homeowners didn’t want to lose any of their existing deck space to a private area, so Rob recommended adding on to the space and creating an enclosed gazebo structure. The new space is essentially its own room for the hot tub! Light and heat were two concerns for the new gazebo. While the hot tub is a place to relax and warm up, if the walls were completely enclosed the room would hold too much heat! To relieve heat concerns, Rob designed the upper half of the walls to be slatted. Additionally, windows with shutter shades were added to allow heat to go out. The slatted walls and windows not only addressed the heat concerns, but also some of the light concerns. As you can see in the picture, light is able to come through the walls and windows. A large lighting fixture was added to the ceiling to provide adequate light at nighttime. 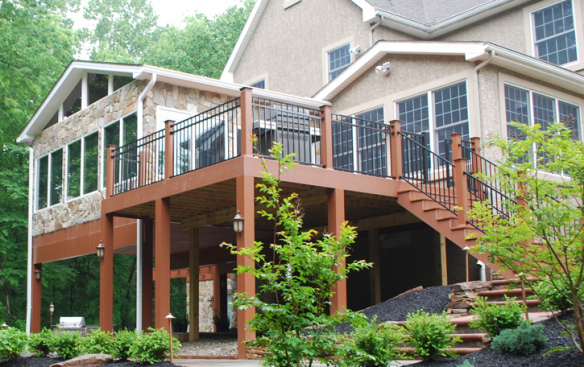 Patio and deck design should fit the needs of the homeowners. As the needs evolve and change, so can the space, just like this example. They didn’t need to tear down their existing deck. 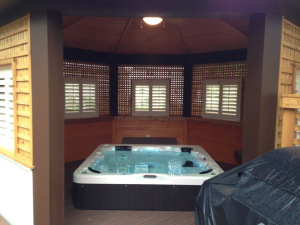 Instead, the outdoor living space was updated to add more privacy and the perfect “room” for their hot tub. 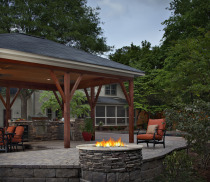 If you have questions on how to improve your outdoor living areas, please contact your local Archadeck Outdoor Living office. One of my favorite parts of the fall is the color of the changing leaves. They are absolutely beautiful. However, it is also the time of year that the temperatures drop and we are often forced inside to warm up. 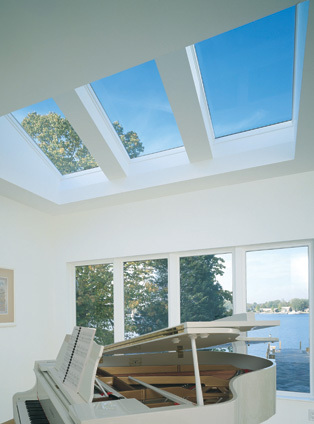 Sunrooms are the perfect place to enjoy the outdoors all year round from the comfort of your home. From escaping the summer heat to feeling as if you are in the middle of a winter wonderland while the snow falls around you, sunrooms allow you to appreciate the outdoors 365 days a year. A room is considered a sunroom when the walls (usually 3 of the 4 walls in a typical square or rectangular room) are made up primarily of windows, allowing sunlight to come in easily. 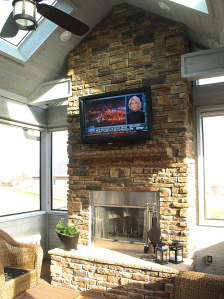 When considering a new outdoor living space, a sunroom is a great consideration. 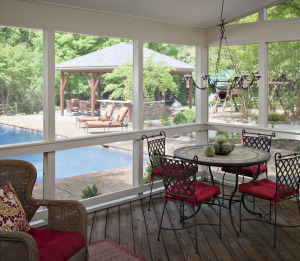 Sunrooms increase the square footage of your home. From a dining space or family room to a playroom for the kids, sunrooms are versatile rooms in your home that you can use however you need. In my parent’s house, they use their sunroom as a place to have drinks and appetizers before moving indoors for dinner. 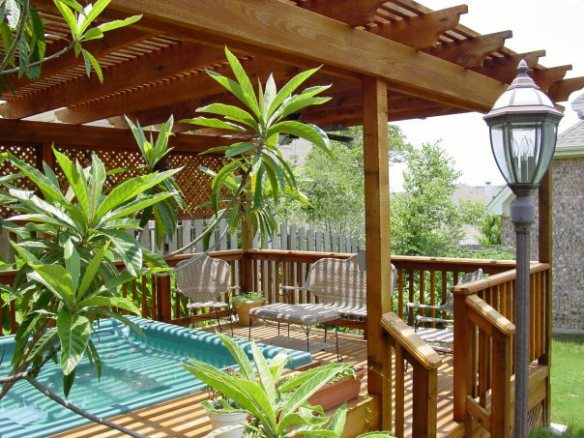 As opposed to decks, porches and patios, sunrooms can be used all year round if built with that intention. As you work with your sunroom contractor to design the space, make sure you can tell your designer that you want the space heated in the fall and winter. When the weather is nice, all the windows can be open to let the fresh air and breeze, but when it is cool outside, you may need a built-in heating option. 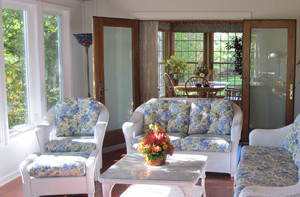 Generally, sunrooms are energy efficient, heating up with the sun’s rays, but there will be times a heater is needed. 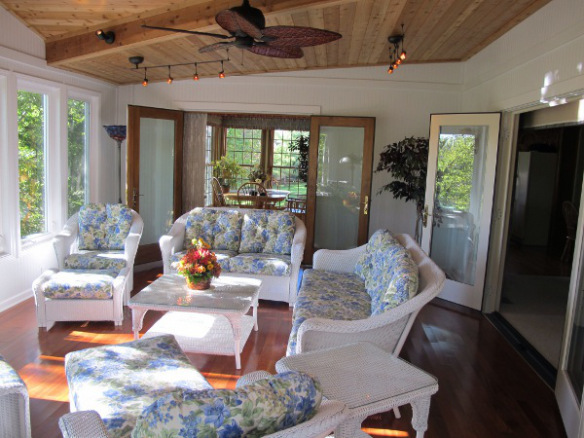 When my parents added their sunroom to the existing home, we were all surprised by how much it affected the rest of the home. It not only allowed more light to come into the general living space (which was a nice surprise), but it also made the layout of the house flow better. Design is key when adding on to your home in any fashion. Pay particular attention to detail if making it look like it has always been there is important to you. For example, if you have crown molding and a certain type of window throughout your home, you may want to include it in your sunroom design. Mimicking the style and architecture of the home is one method to make sure everything works together. 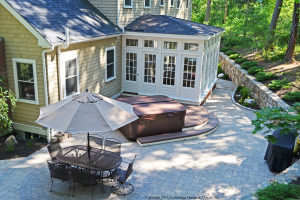 If you have questions regarding sunrooms and sunroom design, please reach out to your local Archaeck Outdoor Living office. As a kid, I remember visiting my aunt and uncle’s house to see their new screened in porch. It was nice, a square room that had 3 screened walls. It fulfilled its purpose as a place to sit and enjoy the outdoors without bugs, but it wasn’t special. It was pretty standard for screened porches of the time, but man have things changed. Knowing what I know now, I see that the plain square screened room is a lost opportunity for a really special space in your home. This screened in porch in Des Moines is beautiful inside and out and may be one of my favorite examples of an “outdoor” structure that is truly usable. 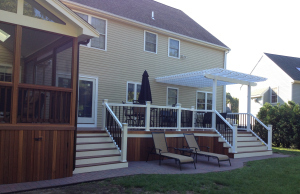 The homeowners wanted an additional porch where they could have a drink with friends and family, enjoy the outdoors without the elements, but most importantly, they wanted an additional outdoor living room. From there, our porch designer in Iowa, Harold, designed this space. You can see from this angle that the structure itself blends perfectly with the finishes of the home. To ensure the inside get optimum amounts of light, windows surround three of its sides and skylights were installed on the roof. 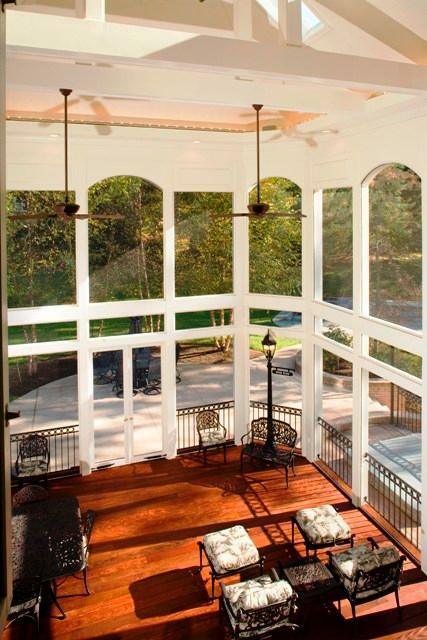 While the outside looks beautiful, it’s the inside and its details that define the screened in porch as a living room. Take look at that outdoor fireplace! The large stone fireplace warms up the space both literally and figuratively, and its mantle and hearth give it a homey look. The placement of the TV is key to making the space it a true living space. It clearly isn’t an afterthought. I also love the lantern like light fixture on the roof. The needs and wants of this homeowner in Charlotte were a little different. He wanted to add a screened in porch to back of his home for an additional place to sit and relax, but needed it to also be a smooth transition to his outdoor patio. His neighborhood is newer and because of construction as well as close neighbors, he needed the ability to block off some of the sides from time to time. 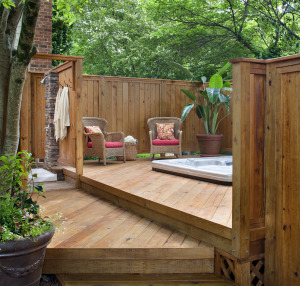 Archadeck of Charlotte designed a simple space that fit all of the homeowner’s requirements. All of the woodwork was finished in whites and creams to provide the brightness. Archadeck 2012The transition between porch and patio was achieved by using the same concrete inside and outside the space. The last issue to work through was privacy. 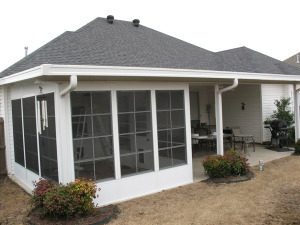 The homeowner didn’t want anything permanent and building in any privacy walls would take away from the airiness of the porch so they decide to install some curtain rods along the exterior that can be opened and shut as needed or wanted by the homeowners. 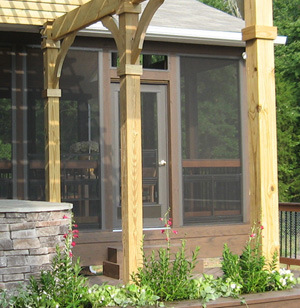 If you have questions regarding screened in porches and how one may add to your outdoor living experience, don’t hesitate to call your local Archadeck Outdoor Living office. 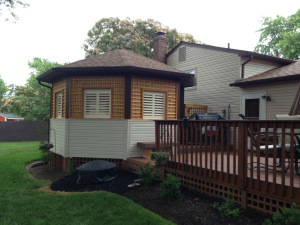 When Steve Folsom of Archadeck of Kansas City first started talking with homeowners in Olathe Kansas, they were looking for replacement for a two-story rotted deck that adjoined their kitchen and living rooms. 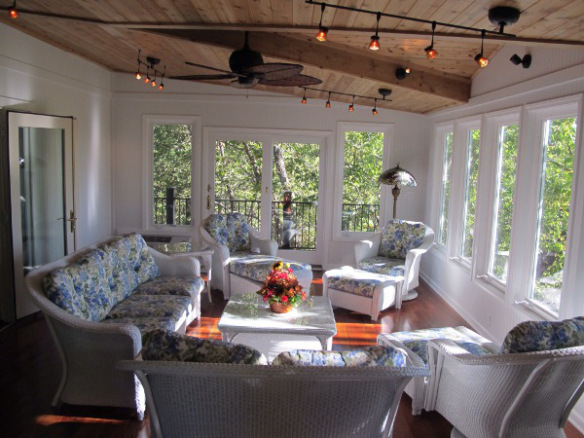 They wanted an upper sunroom above a new lower deck to replace their old two-story deck. They didn’t know all the features and final design details they wanted for the room but they did know he wanted to use it as much as possible, both winter and summer, and throughout the year as much as possible. The planning process becomes a really interactive discussion at this point. Since the homeowners were not sure about the details, here are some of the things that Steve recommended. They wanted to install new french doors from the living room and keep them open a large part of the time so Steve suggested a fully insulated room with auxiliary heat and cooling. Steve suggested low-e double pane energy-efficient windows to maximize comfort and year round occupancy. Then for the design details, in order to give unique architectural look to the room, Steve suggested tongue and groove cedar ceiling trim with painted beadboard wall trim. a larger lower deck under the room. Do you have a deck that you NEVER spend time on? Yet our deck is the room right outside our back door and we let that become an abandoned old rickety un-functional room in our house. Yet, it’s the only room in our house where we can feel the breeze. It’s the only room in our house where we can smell the fresh air. It’s the only room in our house with tremendous natural lighting which is so good for physical and mental well-being. I think a lot of times we put off getting our decks up to snuff because we fear the price of such an upgrade. But now is really the best time to get a quote. We’re going into 2011 and we will make a lot of new spending decisions. We may again decide to put off a vacation even though we annually have some money earmarked for it. We can put that toward upgrading the vacation spot in our back yard. We may put off getting a newer car even though we had some money budgeted for it. The reason we may put these types of things off is because the return on these investments is slim-to-none. At this point in the economy, we can’t afford to spend unless it’s an investment. The return on this investment is high financially and otherwise. 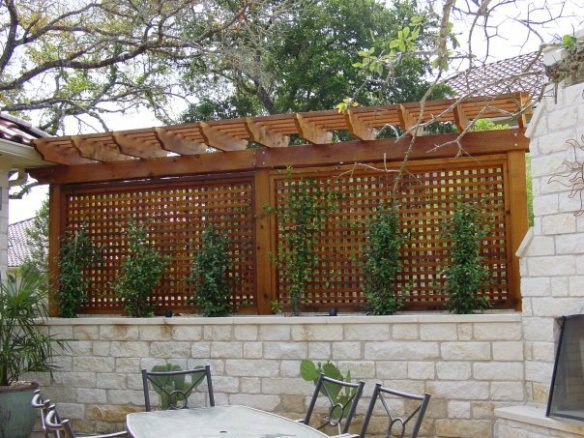 Go ahead and get a quote and a design from a professional who can help you envision the right outdoor space for you. 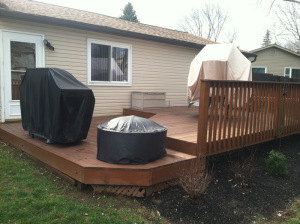 These homeowners in Chadd’s Ford PA had the type of deck we’ve been talking about. It was just too small and it was very old and run down. 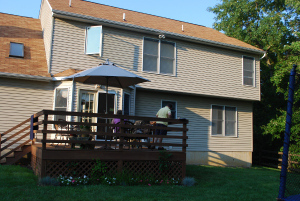 Juan Cardona at Archadeck of Chester County worked with this family to design a bigger deck that also had a nice area for shade so they could enjoy the room outside their back door both in moderate and direct sun conditions. 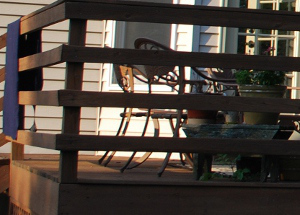 The new deck materials are Timbertech Desert Bronze PVC decking with Timbertech radiance Railing with aluminum balusters from Deckorators. 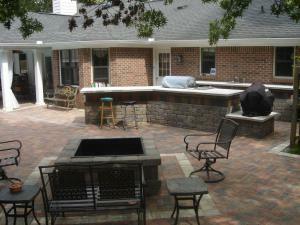 If you live in the Chester County PA area and you’re considering a new backyard project or want to have a free consultation, call Juan Cardona. Phone: (610) 696 – 3340. Or email: [email protected] Visit http://chester-county.archadeck.com/ or visit their Facebook page. 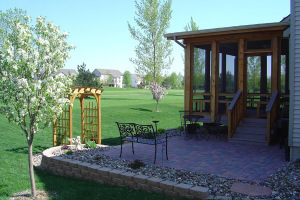 Privacy fences and enclosures don't need to be ugly any more - see some beautiful pictures!